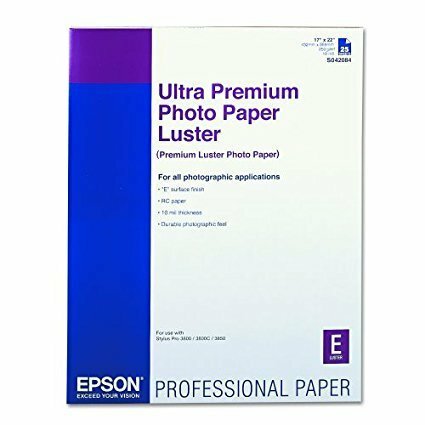 Ultra Premium Photo Paper Luster delivers highly saturated prints by offering maximum ink coverage and a high D-Max for true photographic reproductions. Its 10-mil RC base gives prints a photographic feel, and keeps the paper cockle-free. Epson is a highly recognized brand of inkjet printers and papers and over the past decade has been adopted as the premier printer of choice for professional photographers. Epson, in partnership with many different manufacturers, has created a line of inkjet papers with the professional photographer in mind.